Thank you for reporting on the important issue of teacher compensation. Most American teachers are significantly underpaid for their work, whether we measure that in total annual income, hourly income, or compared to similarly skilled and qualified workers. The “teaching penalty” reflects Americans’ collective disregard for other people’s children, for education generally, for most public services and institutions, and for work done disproportionately by women. And I guess we should be happy to see Time not only reporting on the issue of teacher pay, but further amplifying the discussion by making it a cover story, putting faces to the stories, and using the teachers’ own words. 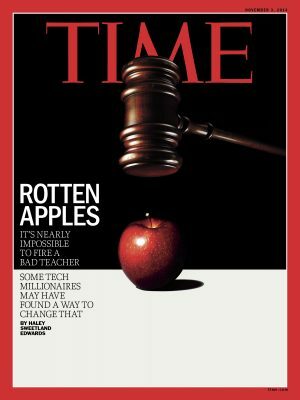 Setting aside the over-generalization (they should have said “what it’s like for many teachers in America” so as to avoid implying “all”), I do recall some other Time covers that dealt with the teaching profession. Could we please take a moment to connect some dots here? Editors, you must realize there’s a connection, right? Not a direct cause-and-effect, and certainly not your problem alone, but take note: you’ve participated in some highly visible ways in the bashing of teachers and public education, and the predictable effect of that approach has been to feed the public’s cynicism about teachers and schools. Why should taxpayers and legislatures invest more in a system that you’ve (unfairly) suggested is riddled with bad teachers who can’t be fired? Time and many other publications jumped on all sorts of education reform bandwagons in the past couple decades. More testing, Common Core Standards, charter schools, “personal” (i.e., computer-driven) learning, evaluating teachers on test scores, ending teacher “tenure” (due process protections), weakening unions. None of them lived up to the hype, and some have been utter failures. With those prior covers, Time misread the moment. 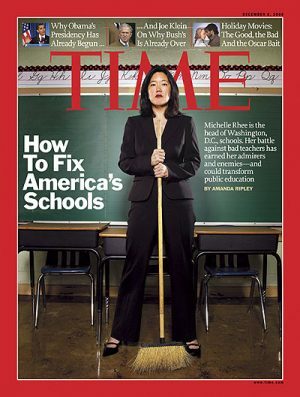 Michelle Rhee was disruptive to the system, but no miracle worker, and she seems to have vanished from the edu-scene. The Vergara lawsuit that inspired your gavel-to-apple cover was later overturned by the appellate court in a unanimous ruling that thoroughly faulted the prosecution’s arguments and the trial judge’s handling of the case. What the United States has not tried is a full-scale commitment to social equity, a Marshall-plan for education, the elevation of teaching to full professional status, with the compensation, responsibility, (and yes, accountability) that should accompany that status. Are you getting any story ideas for future reporting on education? Hopefully, this report and the accompanying magazine covers reflect a shift in thinking about education reporting, and a tacit recognition of past errors – even if it’s not quite the mea culpa America’s teachers deserve from Time.